Masks and the Carnevale di Venezia have long been part of the rich history of Venice. The traditional art of mask making dates back centuries and after falling in disfavor for a period, the Carnival and all its former glory have experienced a renaissance of sorts and now take center stage annually at Venice’s Saint Marks Square. 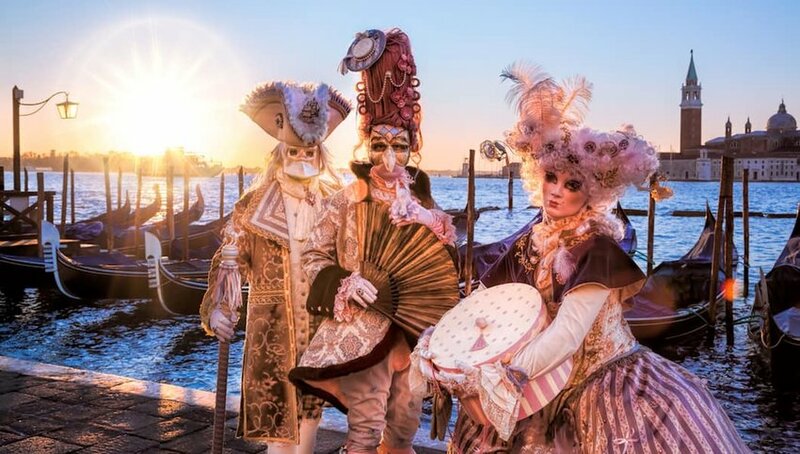 Read on to find out how you can join in the pageantry and celebrations of Carnival while decked out in your own authentic Venetian mask. Carnevale di Venezia is an annual festival held in Venice that attracts party-goers from around the world. It kicks off 10 days before Ash Wednesday and ends on Mardi Gas (Fat Tuesday). All modern-day carnival celebrations, including the over-the-top Rio Carnival, have roots in the Carnival of Venice. The word “carnival” comes from the Italian word for “to put away the meat,” and refers to the season of Lent where meat is not eaten in preparation for Easter. Venetian masks are an ancient art form recreated in modern times during the Carnival of Venice. The original function of masks during the height of the Republic was to conceal one’s identity and social status. The mask would allow the wearer to act freely in a social setting that would not be permitted if their true identity were known. It was common for masked individuals to act in illegal or illicit ways without fear of legal consequences. Masks also allowed people to feel free to explore romantic encounters that they would not dare attempt otherwise. Since 1979, the magic of Carnival has enchanted visitors. It has also rebirthed a flourishing trade in masks, where each year highly-skilled artisans create more and more extravagant and cutting-edge designs. You can’t deny that the masks and their related costumes are the major attraction of the Carnival. 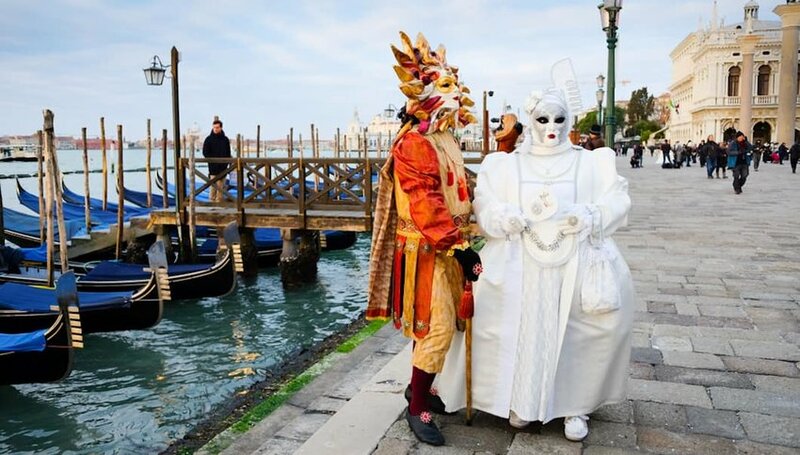 The festival becomes an endless parade of traditional Venetian masks as well as ones that reflect more modern themes and ideas. 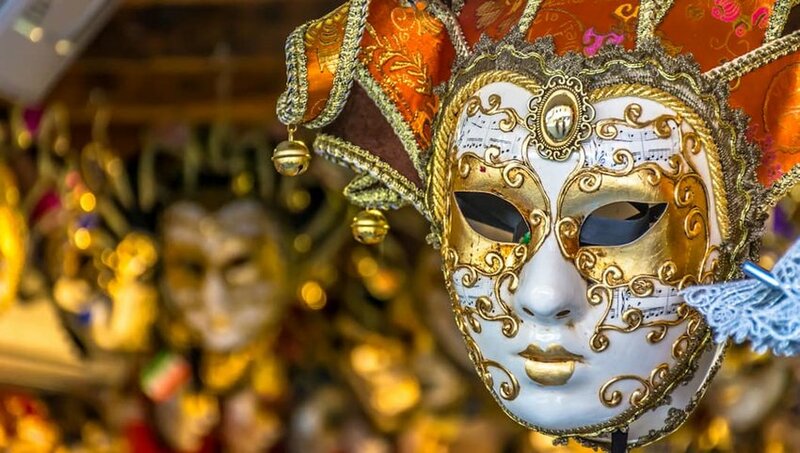 As soon as you hit the streets of Venice, you will want to get right into the spirit of the festival by finding the mask that is just right for you. You can get one for just a few Euros at the stands and shops that line the streets of Saint Mark’s Square. If you really want to experience the true feeling of what the original Carnival felt like, head to the city center and check out the ancient shops that still produce Venetians masks using the same ancient methods from the height of the Republic. Early Venetian masks were quite simple and served a practical purpose. Today, the masks are very elaborate and hand painted with gesso, a white paint mixture, then decorated using gold leaf, natural feathers and gemstones. Authentic Venetian masks are made out of cartapesta (paper mâché) that is lightweight, flexible, and breathable so you can enjoy the late-night festivities that come with Carnival in comfort. If you want to get your own authentic Venetian mask, head to Dorsoduro, a 15-minute walk from Plaza San Marco and visit the most recommended mask dealer in Venice — Ca’ Macana. They make sure that your experience is unforgettable as well as authentic. All of their Venetian masks are made and decorated entirely by hand with care and attention to detail, ensuring that each mask is a true masterpiece. The shop also offers a mask-making workshop where you can learn the history of Venetian masks and even paint your own mask.